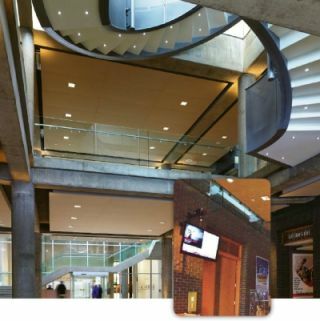 To promote current and upcoming events, the Esplanade Arts and Heritage Centre, located in downtown Medicine Hat, Alberta, Canada, recently installed a new digital signage network powered by the award-winning Audience for Android. The Esplanade is a unique, multi-use cultural facility that includes a museum, theater, art gallery, archives, discovery center, gift shop and café. Its purpose is to bring the work of artists, curators and archivists together with their audiences. It also provides a focal point for art, performance, history and archives, exhibitions and programs, as well as a venue for professional and community-based programs and activities. As part of a cultural service network, it engages in presentation, exhibition, research and education and attracts a diversity of audiences. Advertisements, program descriptions and event listings are displayed on a network of 40-inch LEDs installed in the main and upper lobbies, as well as on a portable solution that can be moved depending on event needs, with the ability to update content network-wide or on individual screens as needed. “Another thing we’ve done is linked the Audience software with our facility booking program to automate the daily-events listings,” Brown said. Capital Networks Limited, a leading provider of dynamic digital signage content creation and management software, introduced the Audience for Android solution to the digital signage market in June 2012, as a low cost alternative to Microsoft OS powered digital signage displays. A number of factors went into the Esplanade’s decision to choose Audience for Android, including the fact that Capital Networks was able to offer a hosted solution. “The idea of a hosted solution allowed us to get the product up and running in a very short time frame without a huge capital outlay,” Brown said. “The training to utilize the system was very straightforward and brief as the interface is very simple to learn. We were able to go live with the system about 30 days after the decision was made to proceed. This is really remarkable when you consider that we started from scratch rather than using some boring old template.